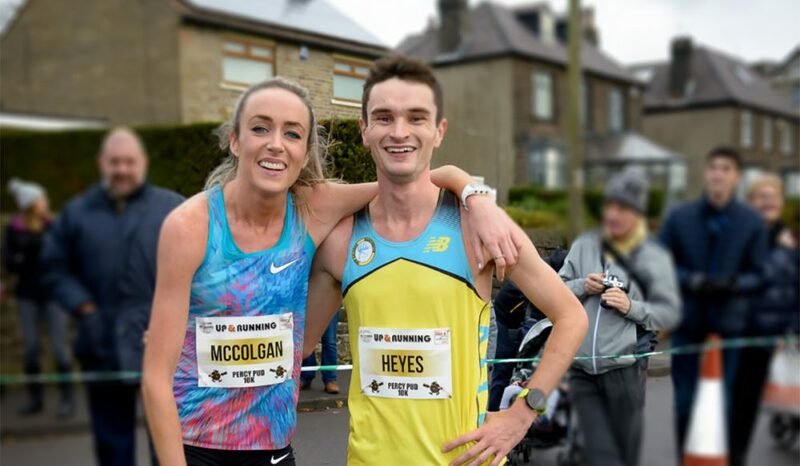 Defending champion Eilish McColgan and Andrew Heyes broke the course records to win the Percy Pud 10k in Sheffield on Sunday (December 3). McColgan took nine seconds off her own course record en route to winning the women’s race in 32:23, finishing second overall. It concludes a fantastic year for the Olympian, who finished tenth in the 5000m final at the Wolrd Championships in London this summer. 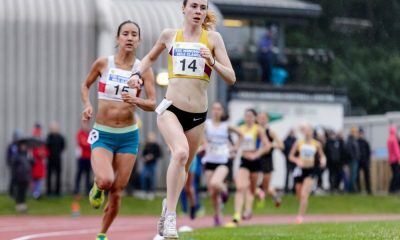 The Scottish athlete set multiple personal bests on road and track during 2017. In recent weeks the GB international ran impressively at the Machester Road Race (USA) and won the Leeds Abbey Dash in course record 32:05. Local athlete Heyes from Hallamshire was a clear winner in the men’s race. The Team New Balance Manchester runner broke the tape in 29:40 to better Mohammed Abu-Rezeq’s 29:57 course record. Second male but third finisher overall was Steve Franklin (Totley AC) in 32:34 and third male was Andrew Challenger also with 32:34. It is worth mentioning that although finishing with a gun time of 34:28 and in 15th position, Abu-Rezeq actually ran a chip time of 30:16, indicating the Altrincham athlete must have missed the start. Behind McColgan, the second female was Calli Thackery (Hallamshire) who finished in 35:16. Sheffield Running Club’s Sarah Lowery in third clocking 36:25. Jack Morris and Kirsty Longley won the Stockport 10, while Matt Sharp and Lucy Reid won in Portsmouth at the Victory 5. Elsewhere, Carl Hardman and Emily Kearney won the third match of the Manchester Cross Country League. In Europe, Steph Twell finished third at the Course de l’Escalade in Switzerland. Round-ups can be found below. On the undulating course that starts and finishes in Woodbank Park, home to Stockport Harriers, it was very apt that Jack Morris of the home club crossed the line first in a time of 51:11. Morris who has previously placed second in 2014 at the Stockport 10, knows the course well as does clubmate Jack Nixon who finished second clocking 51:46. In third place it was Gareth Raven in 53:22. The Sale Harriers runner also finished runner-up at the Manchester Area Cross Country League yesterday. In the women’s race Kirsty Longley of Liverpool, Pembroke and Sefton took the win in 59:13. Longley beat Veleska Wills to the win. The Derby AC athlete clocked 61.04 for second, with Carla Stansfield (City of Hull AC) third in 61.38. On the South Coast, Matt Sharp won the Victory 5-mile race in a time of 23:58. The Enfield Haringey AC finished ahead of Joe Wade of Aldershot Farnham & District in second with 24:47. While Chris Powner of Winchester took third in 25:13. Lucy Reid of Tonbridge AC won the women’s race in 27:34. Laura Brenton of Southampton AC finished second in 27:48 and Beth Kidger (Brighton Phoenix) was third with 27:53. At that the same venue that hosted the annual University Cross Country relays four weeks ago, the Manchester University fields staged the third match of the Manchester Cross Country League. Carl Hardman held off the challenge of Gareth Raven of Sale Harriers in the closing stages to take the victory in 32:58 with Raven one second behind. Most recently Hardman of Salford Harriers ran 2:19:35 at the Berlin Marathon. 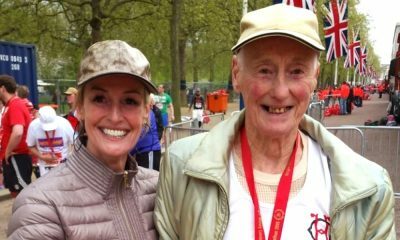 This was his first race back after a short break following the marathon. Matt Barnes finished third in 33:11 and fourth was Andy Norman of Altrincham AC in 33:18. Wirral AC’s Emily Kearney was the winner of the women’s race in 25:48. Kearney who is currently studying at SCAD Atlanta in America looked strong having already competed in six cross country races so far this season. Macclesfield Harrier Sarah Stockman finished second in 25:55 with Anne Kenchington, who won the previous fixture at Boggart Hole Clough settling for third. In the team results, Sale Harriers won the senior men’s match followed by Salford Harriers. The women’s match was won by the University of Manchester team. GB international Steph Twell clocked 24:02 to finish an impressive third at the 40th edition of the popular Swiss road race. The women’s race was won by Helen Bekele in 23:49 two seconds ahead of Kenyan Maggie Masai with 23:51 over the 4.8km course. Twell, who finished 9th at the GB Trials in Liverpool last week, now has her sights on Slovakia, where the Scot will represent Britain for the ninth time at the European Cross-country Championships. Other British results came from Stephanie Barnes (Bristol and West AC) in 12th with 25:39. 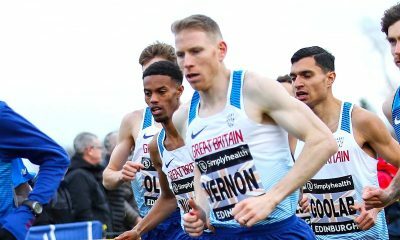 The top British runners were Dan Studley (Bristol and West AC) who showed a great return to form to finish ninth and just behind Swiss international Abraham Tadesse. Studley finished in a time of 21:57, one place in front of Liverpool’s Jonny Mellor with 21:59. Irishman Daire Bermingham was 25th clocking 22:45. Completing the podium was Fredrick Kipkosgei Kiptoo of Kenya in 21:07 with Abel Sikowo of Uganda taking the third spot with 21:37. 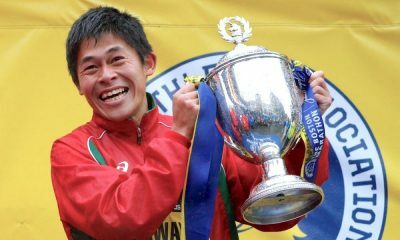 Over in Japan, there was a new European Marathon record set by Norwegian Sondre Nordstad Moen on Sunday (December 3). The 26-year-old clocked 2:05:48 at the Fukuoka Marathon to become the first European to break the 2:06 barrier. A report can be found here.